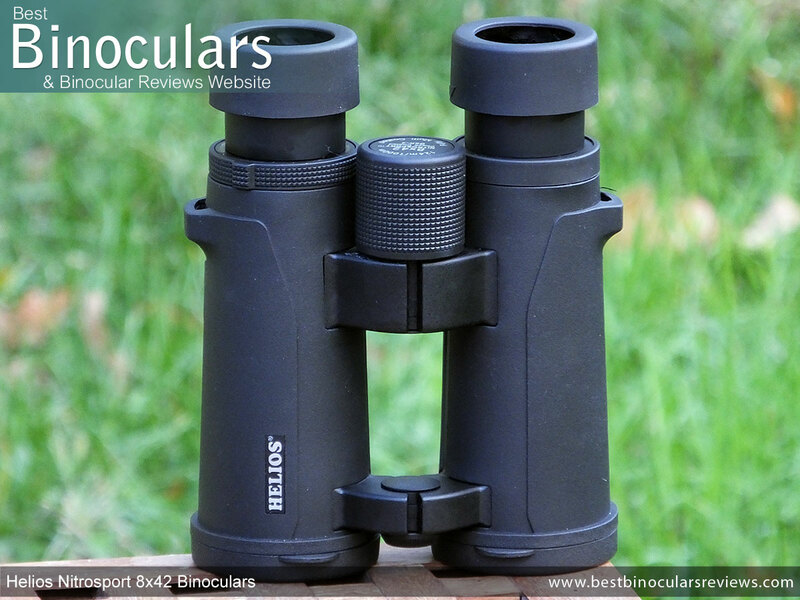 Whilst far from being the most well known optical brand out there, Helios continues to surprise me by offering products that are mostly positioned within the lower price points, but which deliver far more than you'd expect. Take for example the Helios Mistral WP6 8x42 that I reviewed and which went on to share the prize as the Best Low Cost binocular (Under $130 / £130) that I tested in 2016. Main benefit of this shape in my opinion is that it leaves much of the barrels free to hold onto and makes for a secure grip when carrying the bins about in one hand. 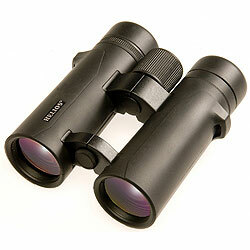 Helios use a polycarbonate plastic to make the main body, which at this price range is common. 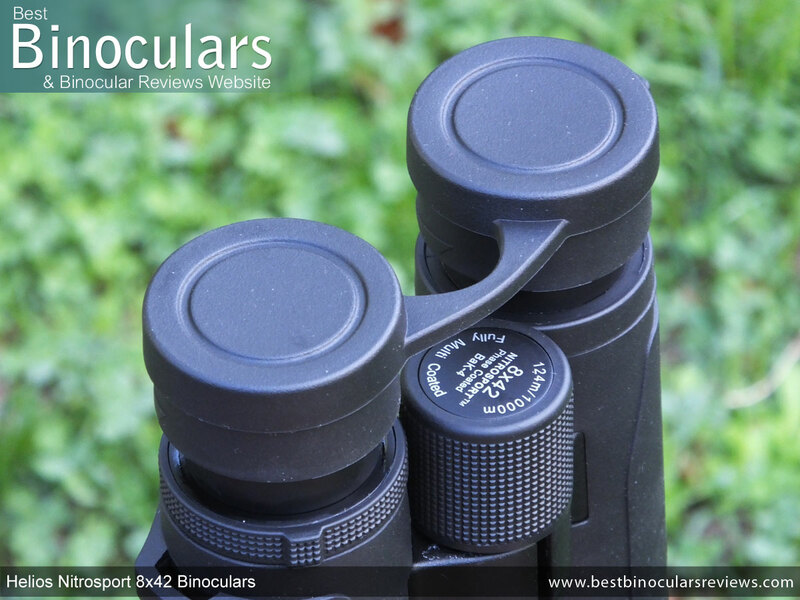 Higher end optics will employ more expensive materials like Aluminium and or Magnesium into the chassis construction, which is not as lightweight as plastic, but does make for a stronger and possibly longer lasting shell. Most bins these days are described as being waterproof, but few (especially in the lower price categories) go on to quantify that statement. So it was nice to read that Helios Nitrosport is rated as being waterproof to IPX Class 5, which means that they are testes and will remain watertight to a depth of 0.5m depth for 3 minutes. Nitrogen gas is also pumped into the chassis during manufacture, this moistureless gas prevents the internal lenses from fogging up. Remember also that a fully sealed instrument is not only protected from water, but will stop dust and other small particles from entering that could also ruin the view. 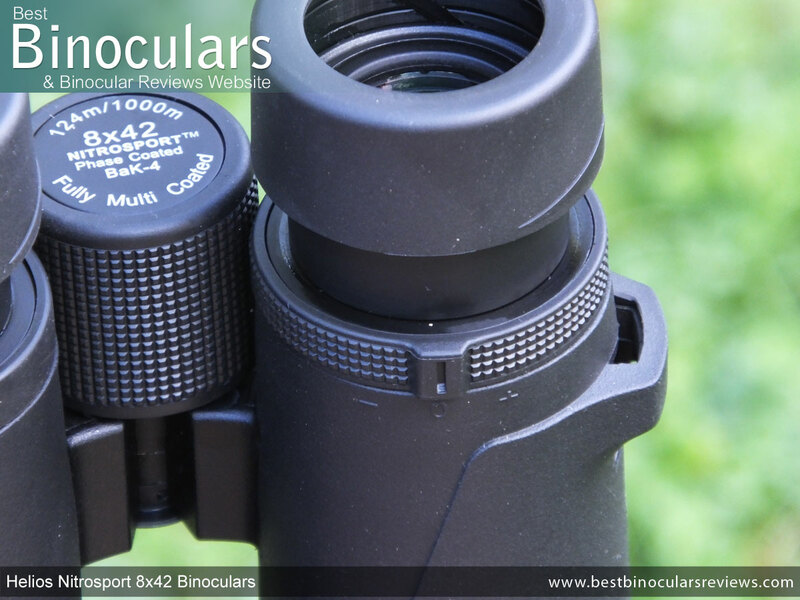 By removing the dust cap located on the bridge closest to the objective lenses, it reveals a thread which makes it very easy to screw in a standard tripod adapter which can then be mounted onto your tripod. 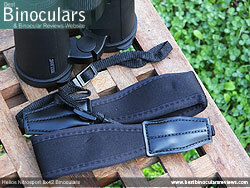 I was impressed to find out that the Eye-Piece housing and the eyecup sub-structure is made from metal. At this lower price it is not at all uncommon for you to have these parts made from plastic to save on production costs. As this is one of the areas that gets damaged most often if you drop your bins, then the importance of this should not be understated. 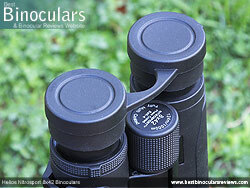 The eyecups themselves are very typical, have an external diameter of 43mm and have a thin rubber coating. Whilst these may not be the most comfortable that I have come across, they are also not particularly uncomfortable. The twist-up (and down) mechanism on my sample was very smooth and whilst the cup did have a tiny amount of free play, they amount is so minimal that it should not be considered an issue. 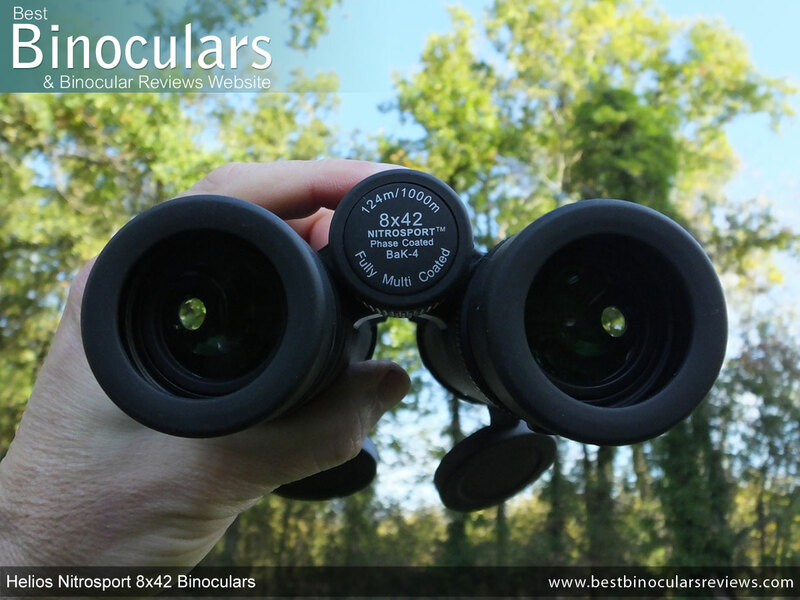 I think whilst technically the eye-cups on the Helios Nitrosport 8x42 binoculars do have a couple of fixed stops between fully extended and retracted, it does not click into them as positively as you would hope and so finding these intermediate levels of eye-relief and staying at them is not quite as simple as on some. However I will add that as most people who don't wear glasses will probably use the bins with the cups fully extended and those who do wear glasses will have them fully retracted, this small point will not be an issue for most users. 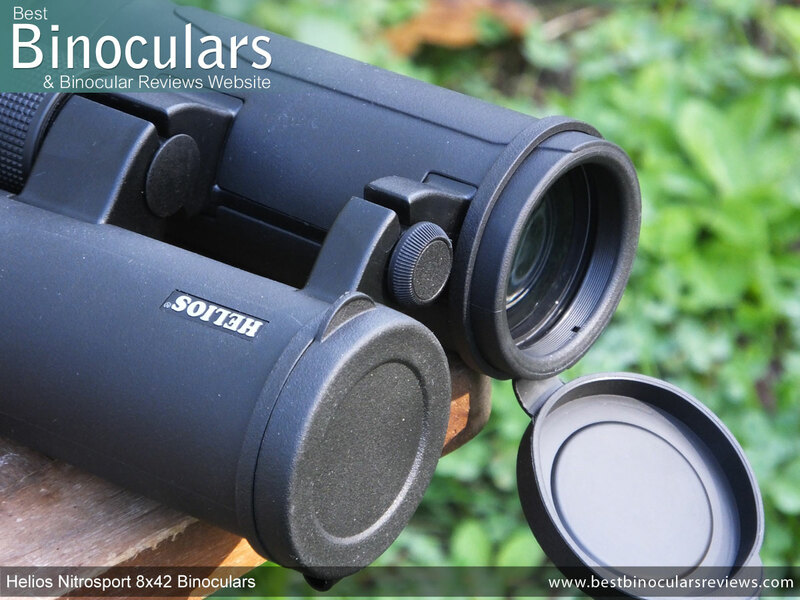 The one on the Helios Nitrosport 8x42 binocular is a little different in that it has two raised knobs on the ring (one under and one on top) makes it easier to adjust, but also makes it easier to move by accident. Consist of 4 elements in 3 groups. 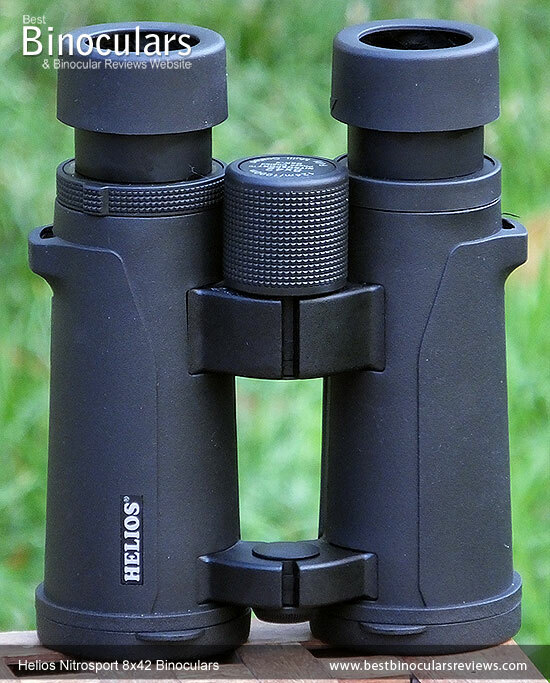 The roof prisms within these Helios Nitrosport's are made from BaK-4 glass which is a good thing as you can occasional find bins at this price with BK-7 prisms which for bins are not as ideal. Good to establish that the optics on these 8x43 Helios Nitrosport binoculars as being Fully Multi-Coated. This implies that every exterior glass surface throughout the entire optical system has been multi-coated with an anti-reflection material. 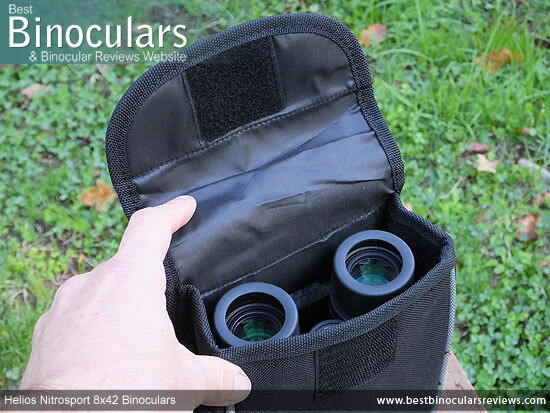 The result is a binocular that will transmit more of the light that it captures in the correct way, for a brighter and better quality image than those with fewer coatings on less surfaces. 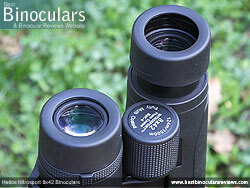 For more check out this section on Anti-Reflection Lens Coatings. I was really impressed to discover that the prisms on the Nitrosport have had phase correction coatings added to them. At this price range this is unusual and most certainly places them above most of their direct competition. The result should be that the image that they deliver is of a higher resolution and potentially with better contrast than those that are not corrected. The prisms on these are Silver mirror coated. Once again this is good as there will be some at this price range that will only have aluminium mirror coatings, which are cheaper, but do not reflect as much light and will therefore probably not have an image that is as bright or as good quality as these. Note: The best option is for roof prisms to be dielectrically coated as this treatment enables the surface to reflect more than 99% of the light that hits it. 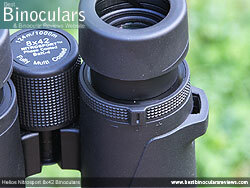 However this process is expensive and is only found on high end optics. 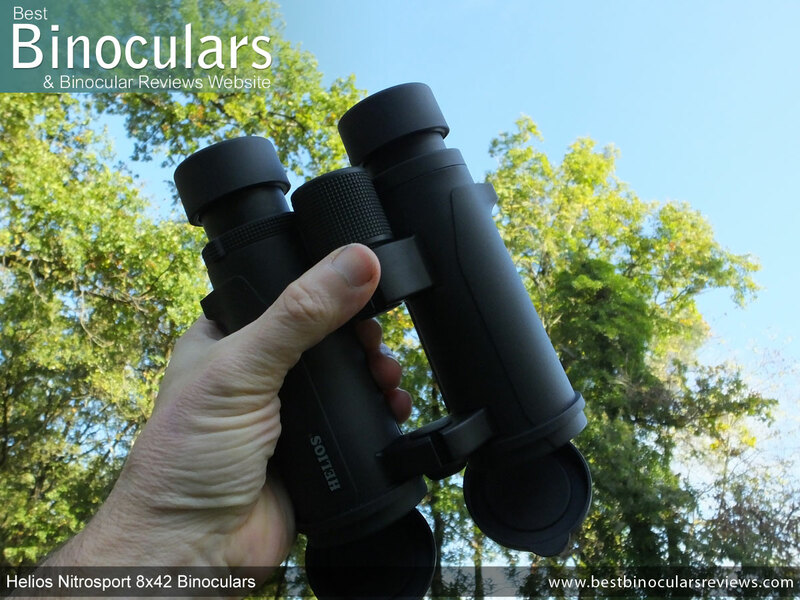 The width/height of the view you see through this 8x42 Helios Nitrosport binocular is 372ft wide/high when measured at a distance of 1000 yards away. 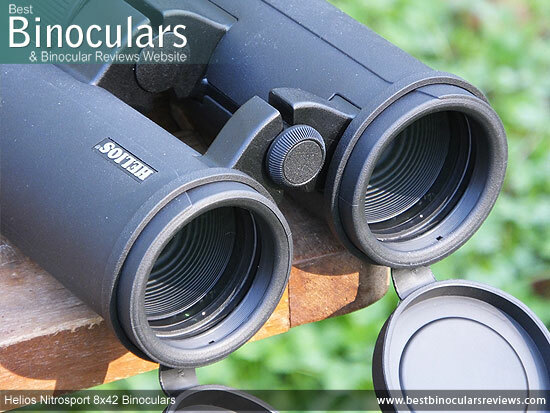 If you compare this field of view to other 8x42mm binoculars, you can see (in the table below) that this is not in anyway bad, but it does place them on the lower end of the scale. The 17mm of eye-relief combined with the reasonably good eye-cups that I have already gone over is good and makes these a good option should you need or want to use your binoculars whist wearing glasses. 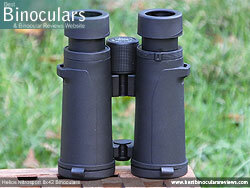 The advertised minimum close focus is 9.8ft, which is a little on the long side for a bin in this configuration. 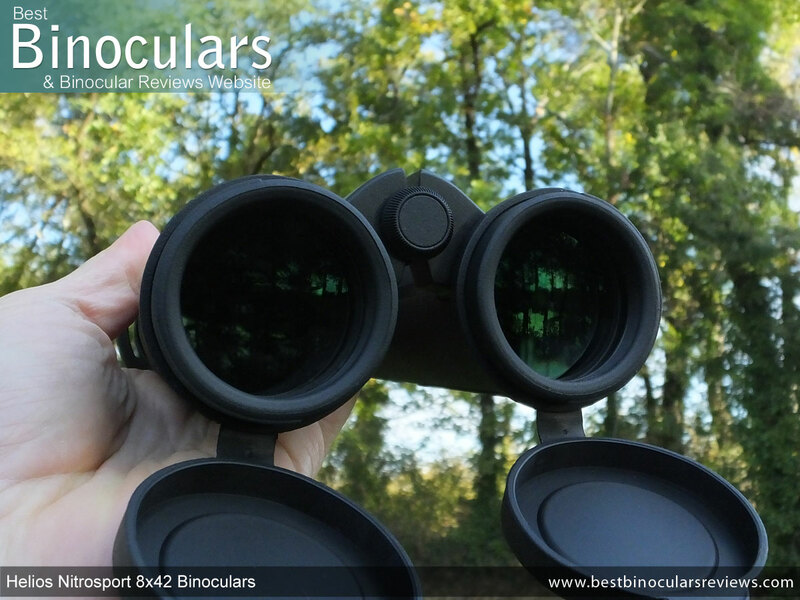 As such I feel that these would not be the ideal choice should you enjoy observing objects (at a museum for example) or things (like butterflies or even birds) from closer ranges. 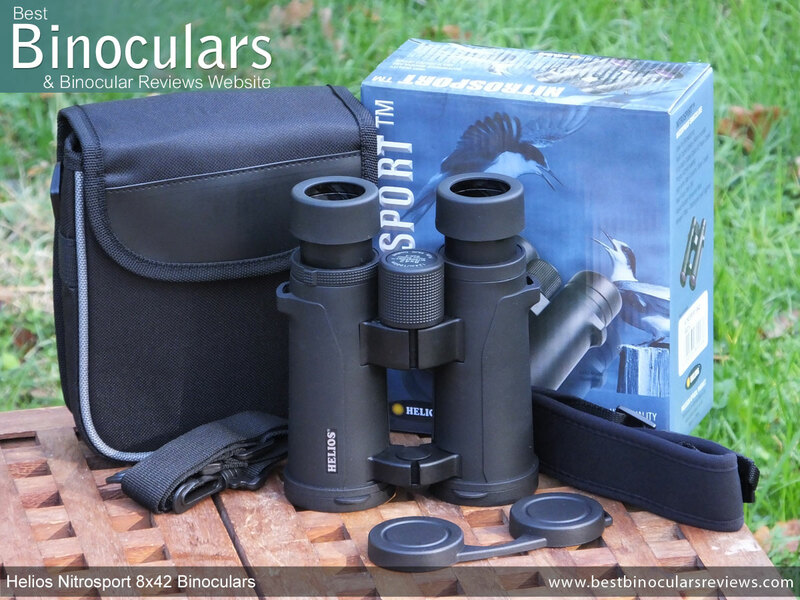 In general use whilst out in the field, my general thought was that for the price the view through these Helios Nitrosport binoculars was good and I was never aware of any distortions or other major flaws in the view. Firstly it s important to establish that the colors of the image looked natura and I could not spot any sort of artificial tinting that you sometimes see, especially in cheaper instruments. 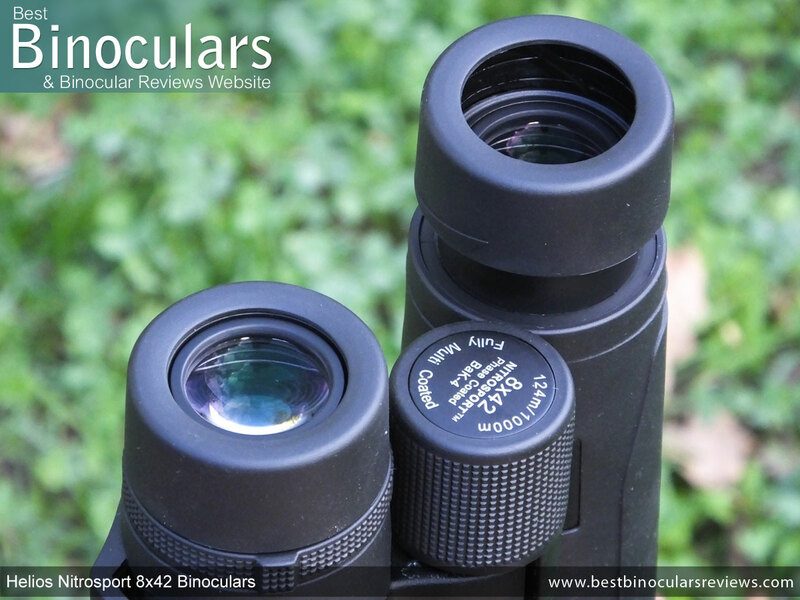 Then I thought that whilst the Helios Nitrosport did lack a certain amount when compared to my alpha 8x42 benchmark in terms of just how vivid the colors are, they were no worse or better than my mid range 8x42 benchmark. Thus I would say for a "cheap binocular" these would do very well if you were to compare them to the majority of their direct competition. The same could be said for the contrast: The amount of contrast looks natural, so not overly contrasting, or washed out. Image brightness to me was the same as that of my mid-level benchmark when compared on an overcast day. Be that looking at bright objects in the sky, or within the dark foliage in trees for example. 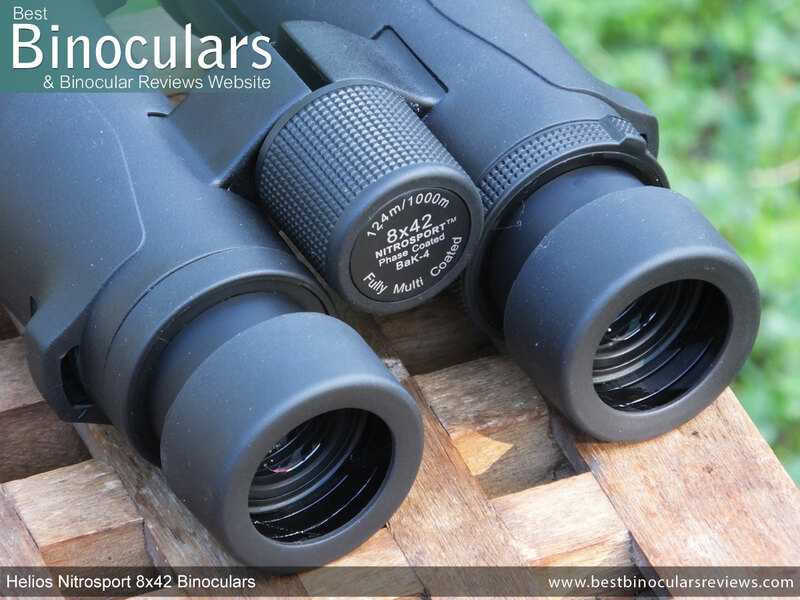 Both were observably less bright than my top of the range 8x42 benchmark which is to be expected, but I have to stress that the amount was not massive and only really obvious when looking at darker areas etc. Under extreme conditions (like viewing a dark object against a bight background), there is a certain amount of color fringing that is evident around the edges of the object. However I have to stress that this level is really not any more than what I expect to see on a mid range binocular and only a fraction less than what I observed through my alpha bins. 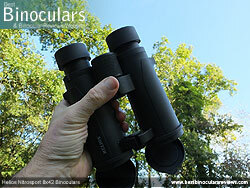 So once again I would have to say that for a cheap binocular, these perform very well in this area. 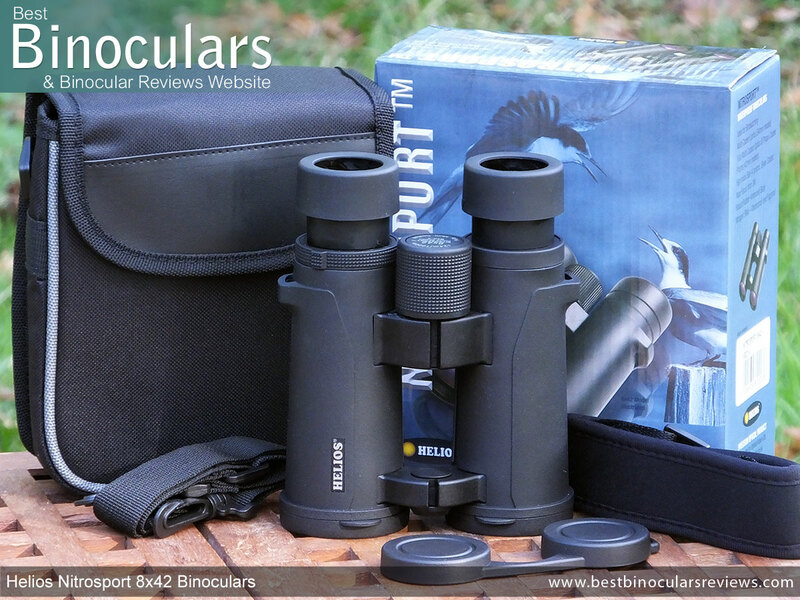 The included accessories that you get with the Helios Nitrosport 8x42 binocular are very typical for an instrument at this price level and can be summed up by saying they are functional, but just lack a little in terms of the attention to detail and feeling of quality. 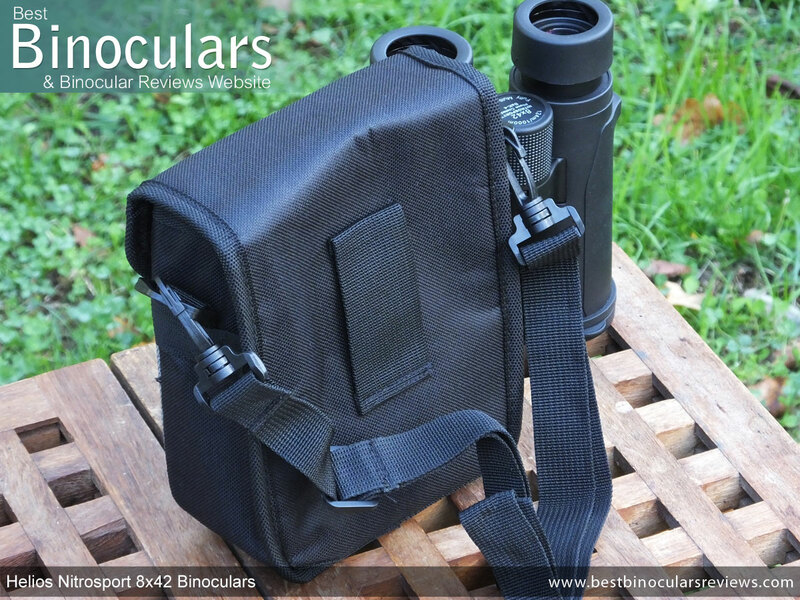 So whilst this is what I would expect, it is a little bit of a shame because the actual binocular is the opposite to this. They deliver more than what I would expect and the feeling of quality is above that of their price tag. 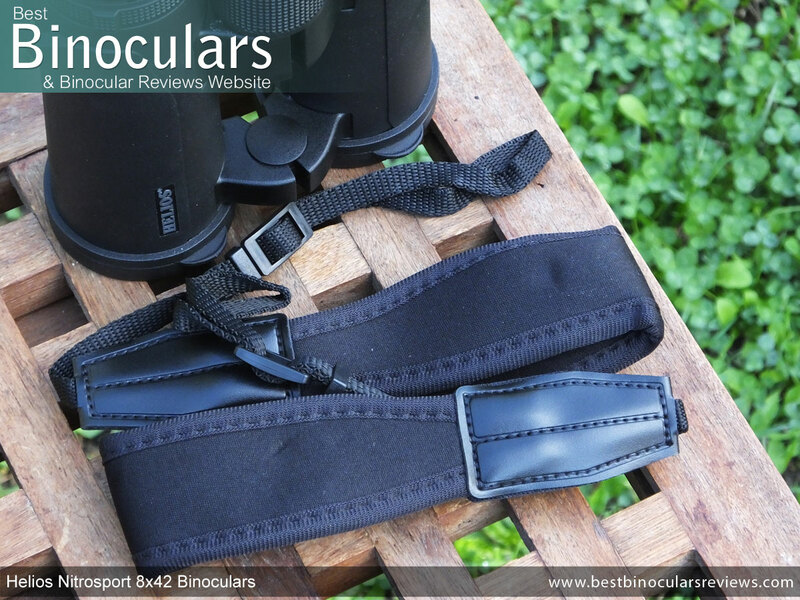 Velcro closure makes for a speedy access, but not as secure as a Zip and need to be aware of the noise it makes when ripping it open so as not to frighten away wildlife/birds. 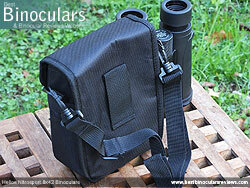 Carry case is unbranded and so looks to be cheaper than the instrument and has minimal padding.